How can IT infrastructure keep up with XR? Augmented (AR) and virtual reality (VR) technologies have passed the zenith of the hype cycle and are slowly coming back down to earth. Yet this doesn’t mean that they have failed to catch on. While we’re still some way off the immersive virtual worlds of fantasy stories like Ready Player One, mixed and virtual reality is going mainstream. You don’t need an expensive headset or room-scale tech to experience VR and AR, collectively known as cross reality (XR). Consumers are also accessing immersive reality experiences through their web browsers. The technology has become an important part of many sectors, particularly for training purposes in industry and construction. 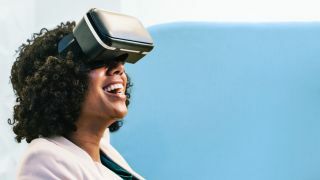 There’s clear demand for these immersive experiences; 50 per cent of companies not currently using the technology will start experimenting with it in the next 2-3 years, and 82 per cent of adopters say the benefits are meeting or exceeding expectations. Immersive experiences will be the next driving force in customer experience. When a consumer tries to buy a house they may enjoy a VR tour or an AR view of different furniture in the space. Fashion retailers are already offering customers AR projections of how clothes will look on them. Products will become more real for consumers, and the concept of ‘try before you buy’ will take on a whole new meaning. However, further and more widespread XR adoption faces a major obstacle in the present; a lack of suitable IT infrastructure. 5G networks, already being trialed by EE and Vodafone, will be instrumental in delivering these immersive experiences to customers, but the applications still need to be stored somewhere. While they differ in scale, XR experiences are digital worlds in themselves. Many are even layered on top of our own real world, emulating its complexity. These services require an immense amount of data to operate, something that traditional data centres will struggle to contain. The challenge is only magnified if user interaction and contributions are encouraged. As users add to this digital world, the amount of data stored increases exponentially. Brands will need environments that can scale with these growing mountains of data. What’s more, XR experiences need to be low-latency; a user won’t wait around for the information they need to load. The magic of an AR app like WallaMe is its immediacy; messages written by the WallaMe community and hidden in the world are delivered in near real-time. If a user had to wait while the service accessed their geo-location information and hunted across several siloed databases for the content they wanted to see, the novelty would quickly wear off. To some extent, customers will wait for the content they want if they have something to distract them. Think of the last time you reached for your phone while waiting for a webpage to load or during a broadband delay. However, when all the user can see is a loading screen you can’t hope to hold their attention for long. XR has the potential to transform customer interaction, but the experience will be compromised as long as it rests upon legacy physical infrastructures. The front-end, mass XR customer experiences of the future will be underpinned by high-capacity cloud-native apps. These are applications developed specifically for the cloud, fully utilising its flexibility and power. Applications, data and memory can all be stored in cloud environments, ready to be streamed to customers on-demand through tomorrow’s 5G networks. The cloud allows businesses to scale infinitely with demand. As XR applications grow in popularity, companies will need more storage space for both their applications and the valuable data – personal and behavioural information – that customers share with them. In a physical environment, you would need to continuously purchase more physical infrastructure to keep pace, but in the cloud it is as easy as purchasing another virtual instance. When demand begins to dip again this instance can be switched off, ensuring the company is not paying for capacity it no longer needs. Cloud-native technologies give companies the ability to deploy innovations and service updates in an uninterruptable continuous cycle, and at a hyper-scale capacity. For more complex immersive services, such as VR games, this is crucial. Users expect constant updates in order to stay engaged, and companies will need to add new features all the time to ensure XR apps reflect their changing businesses. Cloud-native apps deliver a constantly fresh, frictionless, low-latency experience for users, vital for XR applications. Immersive XR experiences will arrive sooner than you might expect. Technological change is accelerating rapidly, and 2019 will be the year that the technology needed to make this a reality is perfected, aiming for ubiquity by the early 2020s. The technology already exists, the task now is to go about commoditising it. Cloud-native philosophies and 5G will make AR and VR customer experiences truly viable. Cloud is the key to making XR affordable for businesses and verisimilar enough to satisfy customers.